Blutdruckmesser.eu is tracked by us since April, 2011. All this time it was owned by It allows persons to check whether a specific domain name Cronon AG Professional IT-Services, it was hosted by Strato Rechenzentrum Berlin, Hetzner Online GmbH and others. Blutdruckmesser has the lowest Google pagerank and bad results in terms of Yandex topical citation index. We found that Blutdruckmesser.eu is poorly ‘socialized’ in respect to any social network. According to Siteadvisor and Google safe browsing analytics, Blutdruckmesser.eu is quite a safe domain with no visitor reviews. Blutdruckmesser.eu has no subdomains with considerable traffic. Blutdruckmesser.eu is not yet effective in its SEO tactics: it has Google PR 0. It may also be penalized or lacking valuable inbound links. Blutdruckmesser.eu domain is owned by It allows persons to check whether a specific domain name Cronon AG Professional IT-Services. It seems Blutdruckmesser.eu has no mentions in social networks. 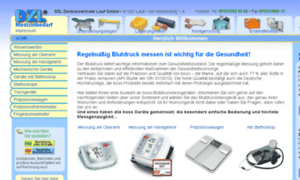 Blutdruckmesser.eu is hosted by Hetzner Online GmbH. Safety status of Blutdruckmesser.eu is described as follows: Google Safe Browsing reports its status as safe.